At any car show, you’ll always have your favorites. Of course this is true with Viva Las Vegas Rockabilly Weekender where the car show, “officially” only runs for Saturday, but there’s tons of smooth kustoms and nostalgic hot rods to see starting from Thursday. While you’re there, grab a beer, say hi to just about anyone you see cause chances are they’re there to have a good time and most car people like to talk about their rides. Or bring beer with you and you’ll suddenly have tons of new friends! So here’s an overview of the cars I like best. If you agree or not, let me know. If you’re the owner and I didn’t get a chance to say hi, please leave a comment and more info about your ride. If you can, say why, “My Ride is Me”. Through my near legendary Google’n skillz, I found out this is a 1961 Plymouth Fury hardtop coupe. The bright orange paint looked stunning in a sea of rust and black paint and who knew this body style could look so cool?! The interior’s got a stylish mix of what could be near stock with a fur lined headliner. A must see! The roof had the same detail found inside… white with a medium flake then more orange over lace and some thin black pinstriping. Is this your 1961 Plymouth Fury?? Who owns this? Before closing the “Unusual Customs” theme, I gotta share one more ride I liked. This isn’t the first custom mail truck or ice cream truck or whatever kind of delivery this old ride might have been, but this one was cool in it’s original looking patina and custom pinstripes. The interior featured some marijuana branded gunney sacks that fit right in… there’s a shot of the pinstriping too at the Viva Las Vegas Pinstriping Gallery. So how’d I do? 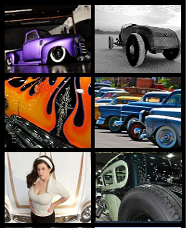 Were these 2 of your favorites from the Viva Las Vegas Car Show too? To see what you might have missed from previous Viva Las Vegas Car Shows, here’s the Viva Las Vegas Car Show info from the last 3 years.